A website version of your Facebook tabs! TabSite is pleased to a MicroSite capability which extends your Facebook fan page custom tabs to the web! Now you have another way to get your Fan Page found on the web. Access your MicroSite in the TabSite Manager area! 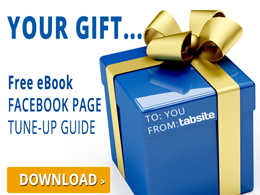 TabSite gives every TabSite user the ability to turn your Facebook Fan Page into its own MicroSite. A MicroSite is a mini website with social sharing features. Automatically pulls in your Facebook Fan Page logo image (top left image). Simply look for the MicroSite button in the left navigation of the TabSite Manager to access your MicroSite tools and select your MicroSite username. Facebook custom fan page tabs are rendered by Facebook in a iFrame, thereby limiting the search indexing of content on the tabs. This means your fan page custom tabs, using any application, are not reliably indexed by search engines. To overcome this and make your fan page content more available across the entire web, we are taking your TabSite Fan Page tabs to the web and integrating features that allows visitors to "Like" your fan page from the website, go to your fan page from the website, and add value to your page by creating more inbound links to your fan page as well as adding easy-share tools to promote more viral sharing of your tab and sub-page content. SEO TOOLS for your TABS! All MicroSites come with SEO Tools to customize page titles (H1) per tab/sub-page, add meta data, and evaluate keyword density at the click of a button! All paid accounts are AD FREE. Paid users control publishing of their MicroSite and control which tabs and which Sub-Pages are published! Yes, you can have a Tab on your fan page and not live on your MicroSite, and vice versa for more customization of your content sharing! Yes, Fan-gating images work on your MicroSite as well! With a a TabSite MicroSite your Facebook Fan Page content will achieve better search engine indexing! If you haven't already done so, SIGN UP for a FREE TabSite today and get ready to use the advanced MicroSite tools available to all TabSite users! And keep your eye out for the release of TabSite MicroSites so you can get your Username! The MicroSite area is selected in the left navigation of the TabSite manager. MicroSite Name - on this tab you can set your MicroSite url. Selections are on a first come, first served basis and our in this format: www.TabSite.com/PlanYourPost. Order / Publish: This allows you to order your tabs in the left navigation of your MicroSite from top to bottom and there is a green light / red light for toggling fan page tabs on or off on the MicroSite. Social Sharing: For Paid Plan users there is the ability to toggle on or off social sharing tools including the "Like", Tweet, Send, and G+ tool. Column Editor: For Gold Plan TabSite users, there is an additional third column (see Digital Hill image above) where you can use any widgets to customize the additional 3rd column area. You can set one 3rd column to be global (applies to all pages), or set a unique third column per sub-page.